Do you fancy taking a tour of ‘Ferran Adrià. Auditing the Creative Process’ without leaving home? Then download our app to your mobile device and take a virtual tour. You can now take a virtual tour of the exhibition ‘Ferran Adrià. Auditing the Creative Process’. With our app of the creative process, you can visit the universe of the Catalan chef and his El Bulli team and ponder the different aspects of creativity wherever you may be. The app is designed for use on mobile telephones, so simply download and install it on your device. It contains all the information you need on the exhibition itself and a map of the creative process, amongst other details. ‘Ferran Adrià. Auditing the Creative Process’ started out in October 2014 in Madrid and opens shortly in the Fundación Telefónica Space in Lima. 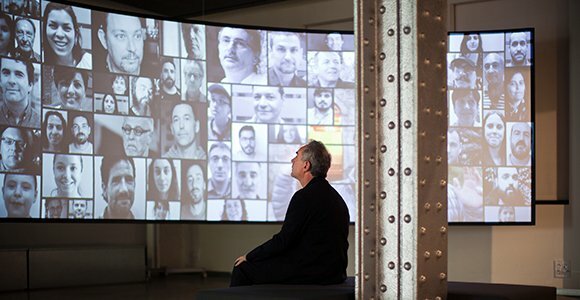 Panels, videos, working logbooks, sketches by Adrià himself, testimonials and a whole array of unique pieces are showcased in the exhibition.